September 05, 2018, 3:30 p.m.
On Monday, Colin Kaepernick, the former NFL quarterback widely known for kneeling in protest during the national anthem, revealed via Twitter that he is a new face of Nike’s “Just Do It” ad campaign, which is celebrating its 30th anniversary. The choice is a bold one, given Kaepernick’s polarizing place in American politics. As numbers from YouGov’s Plan & Track show, 34% of US adults have a positive opinion of Kaepernick, while 31% have a negative one. People who’ve purchased clothing or shoes from Nike in the past three months, however, feel different. Overall, 46% of recent Nike customers have a favorable view of Kaepernick; 23% do not. This suggests that Kaepernick is more liked among consumers who buy Nike products than he is among the general public. Other sports personalities with similar approval ratings among Nike customers include NBA player Carmelo Anthony (47%), UFC fighter Ronda Rousey (46%), and three-time Olympic gold medalist Shaun White (45%). Additional data indicates that recent Nike customers are more receptive to the idea of brands taking a stand on current issues than the average US adult. 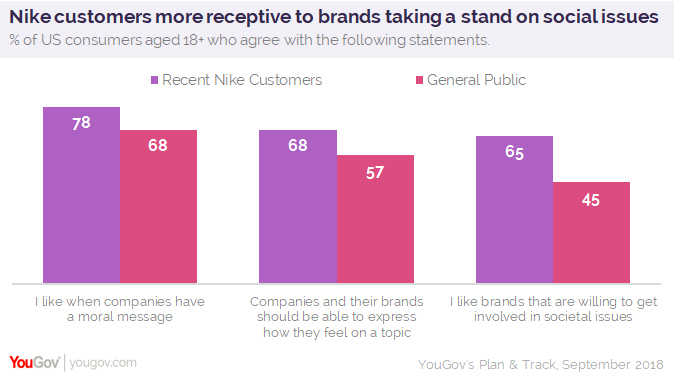 As the figures above reveal, Nike customers are 10 percentage points more likely than the general public to appreciate it when companies have a moral message (78% to 68%). Just over two-thirds (68%) think brands should be able to express how they feel on a topic, while 57% of all US adults feel the same. Finally, a clear majority (65%) of Nike customers report liking it when brands are willing to get involved in societal issues. Only a minority (45%) of the nation agrees. Demographics likely play a role in some of these divergent attitudes. 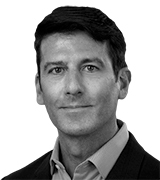 YouGov figures show that, in total, 44% of US adults who’ve bought Nike apparel or sneakers in the past three months fall between the ages of 18 and 34. The same percentage (44%) report residing in a city, as opposed to a suburb, town, or rural area. While members of this consumer group are slightly more likely to skew liberal (27%) than conservative (23%), they’re most likely to consider themselves moderates (34%). Recent Nike customers are also more ethnically diverse than the country’s population at large. Just as many identify as being either black (22%) or Hispanic (23%) as they do being white (46%).